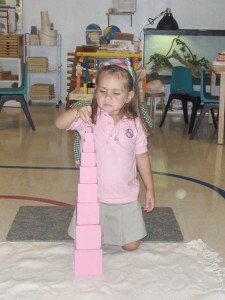 Our Montessori Children’s House environment is designed for children 3-6 years of age. Our Children’s Houses are an exquisite replica of Maria Montessori’s Casa dei Bambini, a house for children. These classrooms are grouped according to Montessori mixed-age settings. Mixed age classrooms foster a sense of community, promote peer learning, allow younger students to observe older students working on higher level lessons, and develop leadership qualities in older students as they mentor the younger ones. At this level children are guided by their own natural interests to choose lessons of daily living or practical life, sensorial, language arts, mathematics, geography, botany, zoology and music. In addition, all students ages 3 to 6 years enjoy art, music, library, yoga, and daily Spanish instruction, as well as a choice of Mandarin Chinese or French instruction twice a week by qualified foreign language teachers. 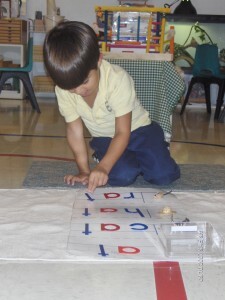 Our curriculum offers three customized options to enrich and strengthen language. The first is a bilingual (English/Spanish) classroom wherein one teacher speaks exclusively English while the other speaks exclusively Spanish. The second is a bilingual (English/French) classroom wherein one teacher speaks exclusively English while the other speaks exclusively French. These bilingual settings use the “One Parent, One Language Method” to create a fully bilingual experience. The third option that students may enroll in is a fully English-speaking classroom. Independence, coordination, order, self-discipline, and concentration are developed in our Children’s House program in addition to an organized approach to problem solving and academic skills. As a child moves throughout the environment, there is freedom to choose from a range of activities and experiences that satisfy his or her unique interests. This freedom of movement to allow for social interactions and creates a small community where an emphasis is placed on care and respect of oneself and of others. 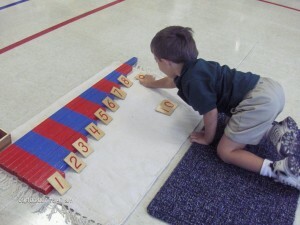 Each class is led by a Montessori-Trained Lead Teacher who is credentialed by the American Montessori Society and holds a minimum of a Bachelor Degree. In addition, there are either one or two assistants in each classroom. The CGMS Children’s House program is flexible and comprehensive. It is comprised of five classrooms each providing several scheduling options: half day program (8:30-11:30), full day program (8:30-2:30), and for our students requiring extended care after our school day, they have the option of After School Care and an array of After School Enrichment Programs available until 6:00p.m. In addition, we offer the option of attending 3 times a week, 4 times a week or 5 times a week. Following receipt of the Admission Application, the school will contact you to schedule your child’s readiness assessment visit. This visit will last approximately 3 hours. August to June Annual Tuition $10,450 half day (8:30-11:30); $12,600 full day (8:30-2:30). Partial week schedules available. After School Care until 6:00p.m. available for our students at an annual cost of $3,000. Tuition may be paid annually, semi-annually, or monthly.